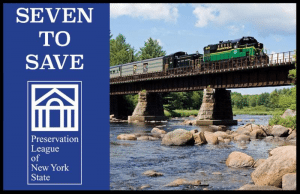 The Preservation League of New York State, the state’s most most prominent advocates for historic preservation, have named the Adirondack Scenic Railroad to its Seven to Save, an annual list of high-priority endangered sites that will receive active League attention in the coming year. The Adirondack Park Agency voted 9-1 on February 11th to approve a controversial plan to remove 34 miles of track between Lake Placid and Tupper Lake and replace it with a rail-trail. 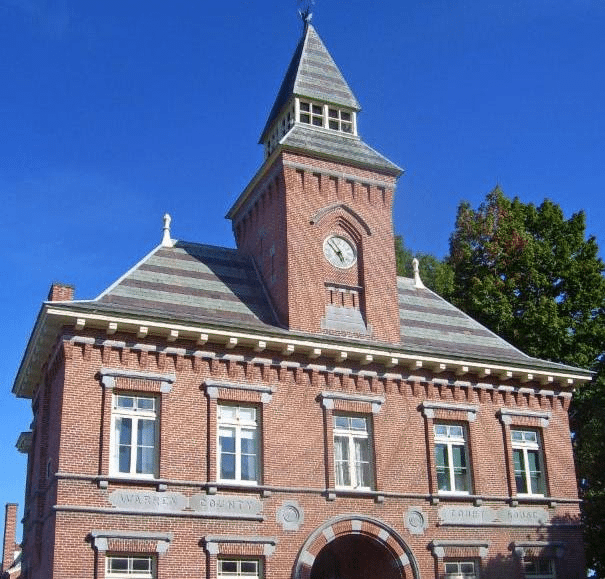 Past recipients of the Seven to Save designation in the region include the Old Stone Barracks in Plattsburgh, Fort Montgomery in Rouses Point, and the Lake Champlain Bridge at Crown Point. What a bunch of bull. Not really a surprise; the railroad advocates have combed the earth to come up with every feasible reason to stop the conversion that a vast majority of people and businesses in the area connected to tourism want, an addition to the vacation and recreation venues that this great area offers. An attraction that will offer 34 miles of a trail that offers some things(not everything) for different age groups to enjoy. Biking is an activity immensely popular in this country, and one that nicely blends with other activities that people interested in vacationing here can put on their to-do list. Fact is biking on Adirondack Rds. in the Tri-Lakes area is hazardous due to various factors. Factors that this trail doesn’t have, like motor vehicle traffic and daunting hills. Walkers, hikers, joggers and yes, snowmobilers in the winter can use this trail in a variety of ways. Will it spark some kind of economic boom by itself? Of course not. 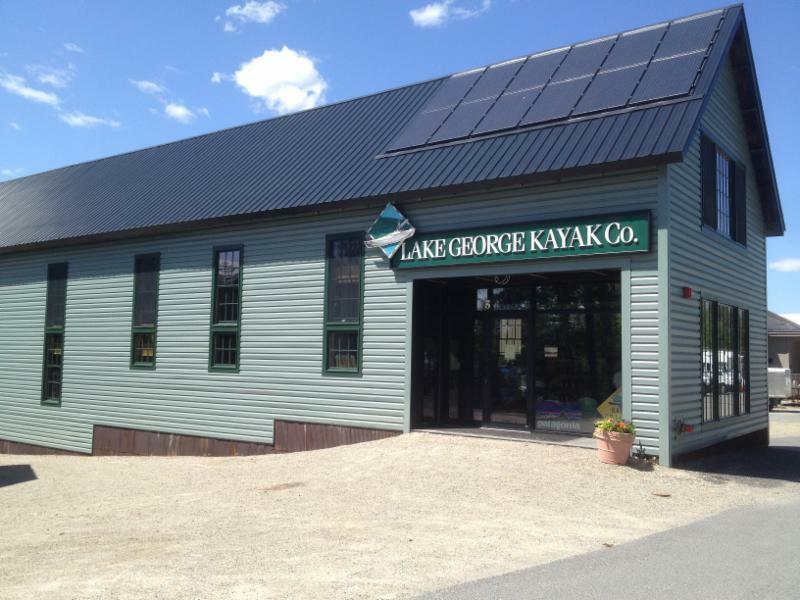 But done right, namely the villages of Tupper Lake, Saranac Lake, and Lake Placid working together and coordinating on assets for the trail, it can definitely enhance both the quality of life for area residents and attract more tourists to this area. I also suggest that to keep this trail from being constructed so that an 8-mile segment can be kept ‘alive’ for the devoted railroad hobbyists is the wrong decision. TL in particular gains nothing from keeping the train as is, and that is the village most in need and therefore with the most to gain. It’s long past the time when this trail should be being constructed and we move into the 21st century and make this great area even greater. They think they have it all figured out, but they forget that the DOT only gives them SHORT TERM leases now, & it would be very easy for the DOT to refuse to renew any lease in the future. The DOT DOESNOT have to give the ASR or the rail explorers any lease, it is their (DOT) choice as to weather the lease is renewed. They don’t have to give a reason for not renewing it either. As the owner of the rail corridor it is their (DOT) choice as to who gets a lease & who doesn’t. Go ahead ASR, make the DOTs day! One reason for not renewing leases is the threatening lawsuit to block the compromise. And as I mentioned once before, if the compromise doesn’t go through, there is nothing to say DEC/DOT will put any money into rehabilitating ANY of the line. The old Lake Champlain Bridge at CP was ultimately demolished. In any case, although the plan has been approved, funding hasn’t; the plan is vague on where the money will come from, although statements that trail construction/rail destruction could start as early as fall would seem be a clear indication of what the state’s real funding priorities are, since rail upgrading could start in the spring without interrupting current limited operations in the tri-lakes. Withholding the lease because of a lawsuit would seem to be a little too raw for even the state to get away with – and what if multiple groups, not just the railroad, come in on the suit? It’s not as simple as the press accounts and Facebook rants would have you believe. Since when is history and historic preservation “bull” ? The tracks, structures, and buildings on the entire corridor are already listed on the State and National Registers of Historic Places. The removal of the rails, and the construction of a trail, is far from a forgone conclusion. Mr. Englehart completely ignored the fact that the trail portion of the rail corridor will be unique in the Park. Unique in the fact the trail will connect 3 sizable towns in a relatively short distance, towns already noted for tourism and as outdoor sports destinations. One of those towns, Tupper Lake stands to gain from the fact it will connect what could become a world class tourist RR to a world class trail. One obvious advantage which he also failed to mention is there are folks who ride the train, folks who would use the trail, and folks who would do both. The compromise is a perfect opportunity to bring the two together, increasing train ridership AND the economic standing of the towns. One of the reasons the Erie Canalway Trail is so successful is it connects cities, towns, villages and hamlets where folks will find services such as motels, restaurants, bicycle rentals and service, etc. That said, sure I would love to be able to ride the train from Thendara to Lake Placid, but I’m not blinded by the idea it has to be one or the other. As far as I know, upgrading the entire line from Thendara to LP at taxpayer expense isn’t a likely option. I suspect the Rail opposition to the compromise will only result in further degradation of the Thendara – TL section. I’m guessing that if it all shakes out in favor of the compromise, the Preservation League will only have two choices. To get on board with support for upgrading the line between Remsen and Tupper Lake, or let the ASR die. I think the latter is not part of their plan. We put people in position to do a thankless job (the APA), we give them the power to amend the SLMP for the betterment of the Park, the Park’s communities, and its users at large, then we take them to court when they do that job, because our self-serving little group doesn’t want the result. We should use the British system of civil law…if you bring suit and you lose, you pay for wasting the other guy’s time and money. There’s this about lawsuits. Yes, they are a pain and an expense – but they are sometimes the only remedy against serious government malfeasance. The threat of lawsuits has the effect of keeping agencies honest – and there’s enough problems with both the process and the plan here to raise serious questions. Read through the amendment the APA just approved, and you can find quite a few holes in its internal logic, things that don’t add up, and things that are omitted completely. While there has been a lot of public debate, there’s also been a certain amount of smoke and mirrors. It may take the courts to cut through it. And they are doing just that as we speak. Look at other management plans that have been approved in the last few years. They have stretched definitions and guidelines far beyond those involved with this plan. They have been sued and always come out on top. To think the a court will overturn the APA for approving something that 2 huge state agnecies approved over vague and inconsistent guidelines in an overly optimistic Hail Mary move. It would also be unique if the state tore up the highway between Lake Placid and Tupper Lake to turn it into a bicycle/snowmobile trail – and it would be one that would run past all the businesses in the area that are crying for customers, instead of sending people (and their money) out into the wilderness. Yes, I know this is a ridiculous suggestion – but then so is ignoring the fact that the railroad is unique AND historic – and could see huge payback if the state invested in it a fraction of the money it calls for sinking into one more trail among hundreds. The historic rail line would be no more unique than a level, hardened, easily accessible recreation trail between TL & LP. The historic corridor is not going away – just a small section would be re-purposed to attract even more users. It’s not a small section – it’s the key section between the biggest communities in the center of the park. And there is real doubt a rail trail would attract even more visitors. Sorry, it just doesn’t add up. No, it doesn’t if you can’t see the other side of the argument or are unwilling to accept a compromise. I can see the corridor being historic, but not the rails. Let them fight this in court. It may take us longer to get a trail in the end, but at least this CAN BE the end of the ASR. If they aren’t already a bankrupt organization, this will finish them off!!! Well, I guess you’re right. Over 70,000 riders annually on the current dinky railroad equals no demand. I’m having a problem with your math, and I’d be curious to know what you consider to be a “demand.” I’m guessing an average ticket price of $13.00, which would equal nearly a million dollars a year, not to mention the money spent in the villages in addition to that. Once the tracks are upgraded to Tupper Lake, there’s no reason to believe the ASR won’t blossom into a world class scenic railroad, because as evidenced by the Great Smoky Mountain Railroad and the Durango and Silverton, you need sufficient track mileage to offer the really first class trains. The ASR will be one of the longer scenic railroads in the country, even just going to TL. As far as the compromise goes, I think it’s a good solution offering two bites at the economic apple instead of just one. Bicyclists and hikers already ride the trains. When the tracks connect to a first class trail, there’s no telling how far it can go. You can’t make an argument that this infrastructure isn’t historic. You can argue that it makes sense to destroy it but not that it isn’t historic. The impact this RR had on the history of the region is huge. Not to be flippant, but what it really boils down to is who cares, and what power they have. Do most people in NYS care if the short SL-LP segment is re-purposed as a recreation trail? I think more people in NYS, including ADK residents, would prefer the compromise if it were put to a vote. To paraphrase your own remark, who cares what you think about what the voters would do? There seems to be little danger they will be heard – DEC/DOT specifically stated they did NOT tally up views on the comments they got for or against the plan. I wonder why. If it had been overwhelmingly pro trail, it’s hard to believe they would not have splashed it all over the media. The silence is telling. All along DEC and DOT have tried to limit the debate to the region, especially the area where anti-rail sentiments are highest. This is despite the larger interest of the entire state in what happens to one of the state’s most valuable resources. I think it boils down to a cost benefit question. I think if you put it to a statewide vote it would be interesting to see how it would go. I can see the ads now. NYS – do you want to see the historic Adirondack RR (the one that carried the likes of Treasure Island author Robert Louis Stevenson and famous baseball player Christy Mathewson to their respite in the mountains) destroyed for a short stretch of flat dusty buggy biking in an area where thousands of miles of hiking and biking already exist? Do you want the rails removed so we can increase snowmobile traffic across parts of Adirondack wilderness lands? Basically turning the corridor into a snowmobile superhighway! Just imagine the spin and the response from the folks in Manhattan and places like that! I can understand why so many people want the rail trail – it sounds like a great thing to have and it would be unique. Problem is, so is the railroad, and it has a proven track record of strengthening the economy. The rail trail won’t come close – and it will end up making the area even more dependent on what the weather does. Over the long term, the railroad has a lot more potential to benefit the area. Tearing up the tracks to put in a trail is a lot like giving kids the pony they’ve always wanted – by cashing in their college fund. Immediate gratification, real trouble down the road. There’s also some questions about what is really going on. This may not be just a struggle between the ASR and ARTA; there are other parties involved with an agenda the public has not had the opportunity to debate. Is it really that unique. How much different is it that the north creek railroad? If it was such an economic engine how come it runs for such a short season and when it does, it isn’t 7 days a week. Why haven’t they hid the accelerator harder? Clearly a lot of businesses who supposedly benefit from the engine aren’t convinced, and if what you say is true, ASR has their self to blame for that doubt. Maybe ASR should step aside and let the State find a better organization to run it. The 30 day operating permit system has hobbled the ASR for years. It’s made it impossible to go after outside grant funding or loans when the plug could be pulled at any time. It’s also kept commercial operators away – for the same reason. Would anyone sink a lot of money into a business – no matter how promising – if they continually faced getting kicked out at the end of the month with nothing to show for it and no repayment of their investment? There’s also been the failure of the state to upgrade the tracks, despite plans to do so. My understanding is that money was finally going to made available – and then 911 happened and priorities changed. The short season is only in the Tri-Lakes. Trains operating out of Utica have a much longer operating season – and the requirement that snowmobiles be allowed to use the corridor precludes operating through the winter. Between that and the gap in the middle of the line, no ski trains. No ESG Winter Game specials. No Fall Foliage Specials keying off Amtrak into the High Peaks. Despite this, the ASR has carried thousands of visitors, created jobs, and had a broader economic impact on that has benefitted the region. They haven’t failed – they’ve never been allowed to go full throttle. I don’t see where the compromise would kill these things, but instead enabling longer trips and shifting some of the financial benefits from LP to TL. The compromise would offer possibilities that you are not likely to have maintaining the status quo. Train buffs seem to feel that this unique type of recreation trail would offer no benefits. What about events and fund-raisers that would take place using the trail, not to mention potential health benefits to visitors and locals alike? What about the educational potential regarding “past” uses of that section that could easily be combined with subtle advertisement for the ‘now’ working, Utica-TL section? Think of the word-of-mouth potential to draw people to the new Utica – TL section. I think if I were a train enthusiast, I would be more worried about the DEC/DOT’s future plans if the compromise is scuttled by special interests and lawsuits. The benefits of the trail have not been denied by the rail people – just that they don’t begin to match what the train does and could do. As to worrying about the DEC/DOT scuttling the promises about upgrading the remains of the rail line, there is absolutely no guarantee they will keep that promise, and serious reason to believe it is meant to keep the rail people happy long enough to get the tracks ripped up. Then they’ll walk away. There is also no guarantee they will continue to lease the corridor to anyone, regardless of the disposition of the rails. They do own the corridor. They could turn the whole thing into a wildflower garden if they want. If DEC/DOT had a strong feeling that the corridor’s future involved rail only, I don’t think we would be having this discussion. Apparently they have their doubts. Another side of the coin is that the State could invest a fortune to upgrade the entire corridor with no guarantee that anyone would lease it, making enough reimbursement to pay off the infrastructure tab. Possibly – but it is usually a better strategy to have something go where you know people already WANT to go rather than have it go where you WISH people would go. Depends what people you are talking about. All one needs is an open mind. Let’s go to court & see how fast that 30 day operating period dries up. If I was the state I’ll kill you pathetic little rail line right off the bat! If even Alaska is having problems with snow, at least they still have something Lake Placid seems determined to deny itself. That’s what I’ve been thinking. When you have lemons, make lemonade. I may be wrong, but allowing snowmobiles to use the tracks when there is sufficient snow may depend more on train schedules, than a requirement that trains quit running in winter so snowmobiles can use the tracks. I’m sure that somewhere nearby there is track clearing equipment if the ASR decides winter trains are in the cards.